The Puppet Master CA is the only Certificate Authority (CA) in the whole infrastructure. It issues certificates for all Puppet agents. It also manages the Puppet Master systems. The Puppet Masters are only responsible for compiling catalogs requested by Puppet Agents – they don’t act as CA themselves. They only accept Puppet Agents which certificates have been issued by the Puppet Master CA. The Puppet Agent retrieves their certificates from the Puppet Master CA the first time they run. They connect to the Puppet Masters afterwards to get their catalogs. They won’t contact the Puppet Master CA anymore. The Puppet Master CA manages all Puppet Masters. In particular it distributes its own Certificate Revocation List (CRL) file to every Puppet Master. The Puppet Master CA also issues certificates to Puppet Agents. From a security perspective setting the SSLVerifyClient option to require increases the protection of Puppet Masters from unknown requests and revoked Puppet Agents. Having the Puppet Master CA manage the Puppet Masters also facilitates the distribution of the Puppet Master CA CRL. On the reliability front new systems won’t be added to the infrastructure if the Puppet Master CA is unavailable. 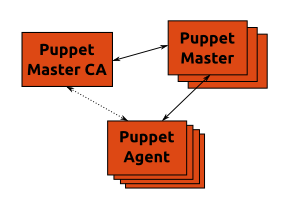 However existing Puppet Agents are still functional as long as they can connect to a Puppet Master. A Hadoop Cluster running on EC2/UEC deployed by puppet on Ubuntu Maverick. The Cloud Conductor is located outside the AWS infrastructure as it needs AWS credentials to start new instances. The Puppet Master runs in EC2 and uses S3 to check which clients it should accept. The Hadoop Namenode, Jobtracker and Worker are also running in EC2. The Puppet Master automatically configures them so that each Worker can connect to the Namenode and Jobtracker. 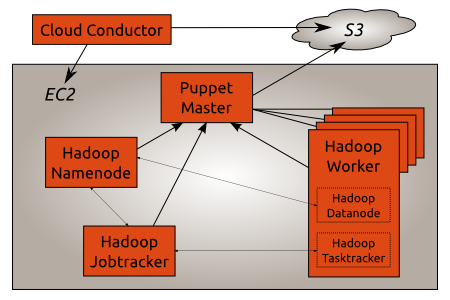 The Puppet Master uses Stored Configuration to distribute configuration between all the Hadoop components. For example the Namenode IP address is automatically pushed to the Jobtracker and the Worker nodes so that they can connect to the Namenode. Ubuntu Maverick is used since Puppet 2.6 is required. The excellent Cloudera CDH3 Beta2 packages provide the base Hadoop foundation. Puppet recipes and the Cloud Conductor scripts are available in a bzr branch on Launchpad. The first part of the Cloud Conductor is the start_instance.py script. It takes care of starting new instances in EC2 and registering them in S3. Its configuration lives in start_instance.yaml. Both files are located in the conductor directory of the bzr branch. s3_bucket_name: Sets the name of the S3 bucket used to store the list of instances started by the Cloud Conductor. The Puppet Master uses the same bucket to check which Puppet Client should be accepted. ami_id: Sets the id of the AMI the Cloud Conductor will use to start new instances. cloud_init: Sets specific cloud-init parameters. All of the puppet client configuration is defined here.Public ssh keys (for example from Launchpad) can be configured using the ssh_import_id option. The cloud-init documentation has more information  about what can be configured when starting new instances. # see cloud-init documentation for available options. A Puppet Master is now running into EC2 with all the recipes required to deploy the different components of a Hadoop Cluster. the Puppet Master internal IP address or DNS name. For example the DNS name of the instance (which is the FQDN) can be used. # when a new instance is started. The first stage of the puppet run sets up the Canonical partner archive and the Cloudera archive. The Sun JVM is pulled from the Canonical archive while Hadoop packages are downloaded from the Cloudera archive. This is normal as there aren’t any Datanode daemon available for data replication. The Hadoop Worker holds both a Data node and a Task tracker. The Puppet agent configures them to talk to the Namenode and Job tracker respectively. The Hadoop Cluster is up and running. Puppet automatically configures them to join the Hadoop Cluster. This morning Evan email hit my inbox: there is a suggestion to create a stack exchange for Ubuntu. I’ve always been impressed by the stackoverflow and serverfault web sites. Granted forums have been around for a long time – however I love the user interaction provided by the folks behind Stack Exchange. A couple of months ago they created area51 to request new ideas that could use the same framework behind stackoverflow and serverfault. And again the user experience for handling these requests is great. In my opinion Stack Exchange provides an excellent user experience that fosters user contributions and collaboration – in-line with the values of the Ubuntu community. So I went over to area51 and voted on the on-topic and off-topic questions for the Ubuntu proposal. Detect problem as early as possible – to recover fast. Nobody’s job is to say no. Throughout the conference I heard multiple times the idea of continuous deployment. With continuous integration being pushed on on the developer side, its pendant on the ops side is continuous deployment: tests, build, deploy. Deploy multiple times a day with a good monitoring system to identify quickly when things go wrong. When things go wrong it’s easier to identify what changed as the number of changes is rather low. All the big shops have a deployment dashboard to review what went live, when and by whom. The launchpad team is already following this idea: Launchpad edge has a daily update of the code running against the production database. Releases (with DB schema changes) are conducted on a monthly basis. And Ubuntu is providing something similar as the development version is always available for installation – and releases are cut every 6 months. Here is a report on Velocity 2010, the Web Performance and Operations conference. In its third year it grew to more than 1100 attendees – this year was sold out. Overview of the chef project lead by the high energy and opinionated Adam Jacob from Opscode. For me the most exciting part was the ability that chef provides a complete view in your infrastructure and the ability to query your infrastructure any way you want. Being able to reconstruct a business from a source code repository, a data backup and bare metal resources. A technical overview of the Grendel project: OpenPGP as a software service. The project gives the ability to share encrypted documents between multiple people. From the security perspective each user private key is stored in the cloud encrypted by a pass phrase only known to the user transmitted via http basic auth. Wednesday was the first day of the conference with keynotes in the morning and three tracks in the afternoon. James Hamilton from Amazon Web Services gave an interesting overview of the different parts of building a data center. An interesting point he made was that data center should target 100% usage of their servers while the industry standard is around 10 to 15% utilization on average. This objective lead to the introduction of spot instances in EC2 so that resource usage could be maximized and Amazon cloud infrastructure can be flat lined. That reminds me of some comments from Google engineers stating that they try to pile as much work as possible on each of their servers. At their scale having a server powered off is costing money. power: the cost of power has a small part of the total cost of running a data center – server hardware being more than half of the cost. This is an interesting point with regards to the whole green computing movement. Urs Hölzle from Google covered the importance of having web page that load fast and a range of improvements Google had been working on for the last years: from the web browser (via chrome) down to the infrastructure (such as dns). He also highlighted that Google page ranking process now takes into account the speed at which a page loads. As heard multiple times during the conference there is now empirical evidence that links directly the page load speed to revenue: the faster a page load the more people will stay on the web site. Release is a marketing concern. Tom Cook of Facebook gave a sneak peak at the life of operations in Facebook. Very interesting talk about the developement practices of one of the busiest website of the internet. Facebook is running of two data center (one on the east coast, one of the west coast) while they’re building their own data center in Oregon. Their core OS is Centos 5 with a customized kernel. For system management cfengine is set to update every 15 minutes with a cfengine run taking around 30 seconds. All of the changes are peer reviewed. On the deployment front bug fixes are pushed out once a day while new features are rolled out on a weekly basis. Code is pushed to 10000s of servers using bittorrent swarms. Coordination is done via IRC with the engineer available in case something goes wrong. The developer is responsible for writing the code as well as testing and deploying it. New code is then exposed to a subset of real traffic. Ops are embedded in engineering teams and take part of design decisions. They’re actually an interface to other ops. Now that we have an efficient process to start instances within UEC/EC2 and get them configured for their task by puppet we’ll dive into improving the performance of the puppetmaster with Phusion Passenger. The default configuration used by puppetmasterd is based on webrick which doesn’t really scale well. One popular choice to improve puppetmasterd performance is to use mod passenger from the libapache2-mod-passenger package. The configuration is based on the Puppet passenger documentation. It is available from the bzr branch as we’ll use puppet to actually configure the instance running puppetmasterd. The puppet module has been updated to make sure the apache2 and libapache2-mod-passenger packages are installed. It also creates the relevant files and directories required to run puppetmasterd as a rack application. Passenger and SSL modules are enabled in the apache2 configuration. All of their configuration is done inside a virtual host definition. Note that the SSL options related to certificates and private keys files points directly to /var/lib/puppet/ssl/. Apache2 is also configured to only listen on the default puppetmaster port by replacing apache2 default ports.conf and disabling the default virtual site. Finally the configuration of puppetmasterd has been updated so that it can correctly process the certificate clients while being run under passenger. Note that puppetmasterd needs to be run once in order to be able to generate its ssl configuration. This happens automatically when the puppetmaster package is installed since puppetmasterd is started during the package installation. I’ve just outlined how to configure mod passeenger to run puppetmasterd which is a much more efficient setup than using the default webrick server. Most of the configuration is detailed in the files available in the bzr branch. In a previous article I discussed how to set up an automated registration process for puppet instances. We’ll now have a look at how we can tell these instances what they should be doing. Going back to the overall architecture the Cloud conductor is the component responsible for starting new instances. Of all the three components it’s him that has the most knowledge about what an instance should be: it is the one responsible for starting a new instance after all. We’ll use the puppet external node feature to connect the Cloud conductor with the puppetmaster. The external node script –node_classifier.py – will be responsible for telling which classes each instance is supposed to have. Whenever a puppet client connects to the master the node_classifier.py script is called with the certificate name. It is responsible for providing a description of the classes, environments and parameters for the client on its standard output in a yaml format. Given that the Cloud conductor creates a file with the certificate name for each instance it spawns we’ll extend the start_instance.py script to store the node classification in the content of the file created in the S3 bucket. You may have noticed that instances started by start_instance.py don’t have an ssh public key associated with them. So we’re going to create a login-allowed class that will install the authorized key for the ubuntu user. We’ll use the Ubuntu Lucid Beta2 image as the base image on which to build our Puppet infrastructure. Start an instance of the Lucid Beta2 AMI using an ssh key. Once it’s running write down its public and private DNS addresses. The public DNS address will be used to setup the puppetmaster via ssh. The private DNS address will be used as the puppetmaster hostname given out to puppet clients. Edit the node classifier script scripts/node_classifier.py to set the correct location of your S3 bucket. Note that the script is set to return 1 if the certificate name doesn’t have a corresponding file in the S3 bucket. You may want to change the return code to 0 if you want to use the normal nodes definition. See the puppet external node documentation for more information. The puppetmaster configuration in puppet.conf has been updated to use the external node script. There is also the login-allowed class defined in the manifests/site.pp file. It sets the authorized key file for the ubuntu user. On the puppetmaster edit manifests/site.pp to update the public key with your EC2 public key. You can get the public key from ~ubuntu/.ssh/authorized_key on the puppetmaster. Note that you’ll have to set the node_terminus to plain to avoid calling the node classifier script when configuring the puppetmaster itself. Otherwise the puppet run would fail since the puppetmaster certificate name (which defaults the to fqdn of the instance) doesn’t have a corresponding file in the S3 bucket. We have now our puppetmaster configured to look up the node classification for each puppet client. It’s time to update the Cloud conductor to provide the relevant node classification information whenever it starts a new instance. The start_instance.py script has been updated to write the node classification information when it creates the instance file in the S3 bucket. That information is actually set in the start_instance.yaml file under the node key. All of the node classification information expected by the puppetmaster from the external node classifier script is set under the node key in start_instance.yaml. See the puppet external node documentation for more information on the information that can be provided by the external node script. Review the start_instance.yaml file to make sure the S3 bucket name, the puppetmaster server IP and CA certificate are still valid for your own setup. The instance has booted and registered with the puppetmaster. The puppetmaster checked if the client request is expected and signs it. The puppetmaster compiled a manifest for the client according to the information provided by the node classifier script. Make a note of the instance ID and its public DNS name. Run euca-get-console-output instance_ID to get the ssh fingerprint. You may need to scroll back to get the fingerprints. The start_instance.py script is currently very simple and should be considered as a proof of concept. Storing the node classification information into an S3 bucket makes it also easy to edit the content of the file. It also provides an easy way to get a list of the nodes that have been started by the Cloud Conductor as well as their classification. If you look at the start_instance.py script you’ll notice that the ACL on the S3 bucket is ‘public-read’. That means anyone can read the list of your nodes as well as the list of classes and other node classification information for each of them. You may wanna use S3 private url instead. We now have a puppet infrastructure where instances are started by a Cloud conductor in order to achieve a specific task. These instances automatically connect to the puppetmaster to get configured automatically for the task they’ve been created for. All of the instances configuration is stored in a reliable and scalable system: S3. With instances being created on demand our puppet infrastructure can grow quickly. The puppetmaster can easily be responsible for managing hundreds of instances. Next we’ll have a look at how improving the performance of the puppetmaster.